Toothpaste. Contact lenses. Water filters. Wine. Scammers aren't just ripping off expensive designer clothes and watches anymore. They've turned to more mundane items that are probably on your grocery list or in your medicine cabinet. And knock-off products aren't just sold out of car trunks or on the streets. They're sold all over the internet and on store shelves. "If it's made, it's counterfeited," said Christopher Robertson, acting director of U.S. Customs and Border Protection National Intellectual Property Rights Coordination Center. 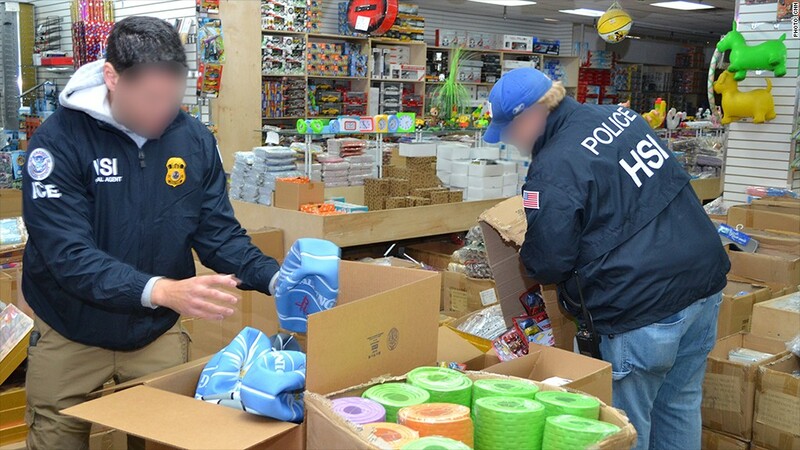 The problem is that counterfeit household products can often pose a threat to consumers. And some fakes look so much like the original that it can be hard to tell the difference until it's too late. Toothpaste was one famous example. In 2007, toothpaste carrying the "Colgate" label was recalled in four states for potentially containing a poisonous chemical. "We have seen toothpastes with antifreeze in it," said Robertson. Contact lenses are another target for counterfeiters, and fakes can be a potential health concern for unsuspecting consumers who wear them. The best case scenario is that they simply won't improve your vision, and the worst case is that they can damage your eyes. "They could be stored in a solution that's not sanitary and infect the eye, or they aren't made right and scratch the cornea," said Heather McDonald, chair of the International Trademark Association's anticounterfeiting U.S. subcommittee. Just last month, government officials issued a warning about counterfeit decorative contact lenses ahead of the Halloween shopping season. The government has seized more than 20,000 pairs of counterfeit and decorative contact lenses this year. The government also began seizing fake water filters this summer, according to Robertson. He said toys are commonly counterfeited as well. "If any of the parts are cheaply made, they risk coming off and being choked on or ingested or contain lead levels above the allowed statutory limits." Counterfeit guitars are also popular items on the market. There have also been cases of counterfeit airbags that don't deploy or expel metal shrapnel when they do. Even a bottle of wine can be a fake. Police in Italy recently apprehended 30,000 counterfeit bottles of cheap wine being sold with a fancy label as a more expensive vintage. The internet has made knock-offs more prevalent and easier to sell directly to consumers. Scammers set up mirror websites to look like a retailer's official online store or tempt shoppers with deep discounts on brand-name fake items. Red flags that could suggest a website isn't legitimate is a lack of contact information, use of a third-party page for payment and grammar and spelling mistakes. According to McDonald, counterfeit products can also show up at discount retailers. "They get duped just like the rest of us to save a couple cents." China remains the top source of manufacturing and distributing counterfeit merchandise. And flagging a bogus product is hard -- even for experts. Consuming counterfeit goods can hurt consumers, and they can also hurt the original brand. "If you [unknowingly] have a counterfeit version that doesn't work, you aren't going to buy that brand again," said McDonald. She recently bought super glue that didn't work and discovered it was a fake. Spotting fakes of household goods can be difficult as the packaging tends to be nearly identical. Robertson suggested always questioning the location of where you're shopping and the discount you're getting, and to stick with authorized dealers. And when considering what seems like a fantastic deal, remember this old adage: If it sounds too good to be true, it probably is.